Having read and studied a few books on writing, most of which had to do with writing fiction, I was curious to see what I would learn from one of the pre-eminent authors in my own industry and sphere. 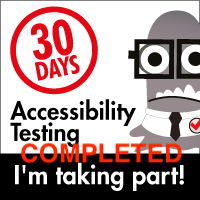 If you are a developer or a tester and you haven't heard about Gerald Weinberg, well, where have you been? That's like being a student of the history and not knowing who Victor Davis Hanson or Gwynne Dyer are. 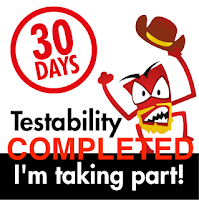 Suffice it to say that Gerald "Jerry" Weinberg is one of the most prolific testing and development writers out there, and his books cover lots of areas related to software testing, consulting, systems thinking, etc. 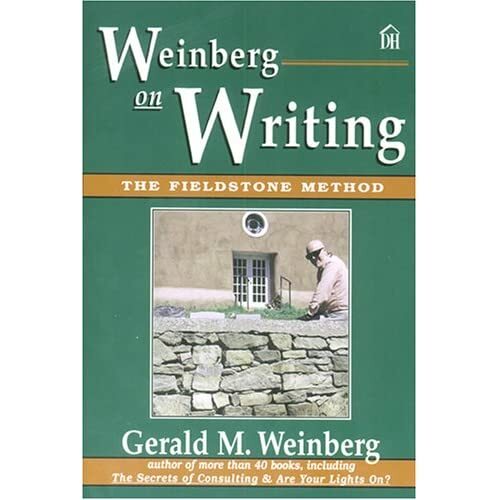 Thus I was excited when I saw that he had a book dedicated to the craft of writing, and that it was called The Fieldstone Method (hmmm, we use a process in the Black Box Software Testing classes called "fieldstones", too. Are the terms related?). Jerry starts out with a confession that he wasn't really a fan of the way writing is taught in college English classes. For that matter, neither was I. High School and College about killed my desire to write anything more than just what was needed for my classes, and "The Term Paper Manual" that was all the rage in the 70s and 80s scarred me for life. Jerry tells the story of a college writing class that changed his life, when he turned in an angry screed about why he refused to do the stupid assignment as assigned. He thought he'd get kicked out of class. Instead he was told it was the best paper the teacher ever received, and as long as he promised not to tell the rest of the class, he could turn in a paper each week on whatever topic he wanted to. Jerry's takeaway from this… never attempt to write what you don't care about. If you do find yourself writing about something you don't particularly care about, try to find a way to convert it into something you do care about. The metaphor of "fieldstones" relates to stone masonry. If you have ever seen a rustic wall, one built out of various stones, you will notice that they are not uniform, they are not symmetrical, they are often pieced together with stones of considerably different size, and yet, with skill and practice, the wall is built and looks really good. Writing is much the same way. The stonemason in the country would take the time to gather up as many fieldstones as they could find and collect them together. It's possible it might take many days, weeks or even months to find all the stones they will need, but once they have them, then they have all you need to piece them together to make the wall. Likewise, for successful authors, we aren't going to find much of value in the first places we look. Let's face it, if we did, that stuff has already been written, and written to death. So how do we get our stones in the writing sense? By not writing just one thing at a time. We gather little bits, and have many threads running at the same time, sometimes waiting for the next stone to fall into place so we can build the next layer of our "wall". Looking at this metaphor, it makes sense of the various file scraps that I have in my Dropbox folder… this is exactly how I write! I just never really had a term for it… now I do :). Jerry discusses writers block, and that often the reason writers get blocked is because they are looking for a way to linearly get their thoughts down on paper, and for many of us, this is the exact opposite of how we gather our ideas. Case in point, right now I'm doing a daily synopsis of a book I helped write. I decided that I wanted to also post something other than just the daily synopsis so as to not completely tune out my readers who aren't interested in the book I'm discussing. I thought at first this would be difficult, but the opposite seems to be true. The more I write about the chapters regarding "How to Reduce the Cost of Software Testing", the easier it is for me to put out two or more posts a day (or some days even three or four to line up and schedule to post). Alternately, if I don't write anything for several days, getting a blog post together is painfully difficult. In short, it's hard to build a wall when you've done little or no gathering. Many of us get confused with the notion of writing something when really what we mean is writing something down. The writing down is relatively quick. It's the gathering that takes the most time, and that's part of the process as well. What's more, different people will gather different stones, because they are different people with different goals, ideas, and interests. There are more than enough stones for everyone, but you have to gather them :). So where do we gather them? For me, it's this blog, the published and unpublished bits. Believe me, there's many draft scraps that never see the light of day… but they might someday, you never know. The key is, have a place to gather, so you can have something to mine when you want to write. Much like building a wall, often the stones we get come from, well, another wall. There's a reason why I have gone through and reviewed close to 40 books in the past 18 months… they give me further ideas to explore, and sometimes those ideas come straight out of the books I've already read (yep,this one too : )). We've been taught that copying others work is plagiarism. If we do indeed just copy it verbatim, then yes, that is plagiarism. But if we use a kernel of the ideas for exploration onto other avenues, then those are just as legitimate fieldstones as any others. For me, though, I feel if I'm really exploring someone elses work for my own ideas, I will make mention of their efforts as a guide to mine. This is what I did for my chapter in How to Reduce the Cost of Software Testing; I came up with my own conclusions, but much of my ideas for Automation ROI would have not been worth talking about had I not read Dion Johnson's ideas and analysis first. He approached the idea first, and I went on a tangent because of it, but he absolutely gets credit for sparking the idea, so absolutely I gave him credit for it :). Many times I intersperse personal reflections in my blog, often looking to find ways to make them relate to the world of software testing. These personal "parables" often are a great way to get me writing, because they give me a chance to mine my own memory and often seemingly mundane surrounding for interesting ideas. Often what I think may be a silly diversion turns out to be something with sticking power. I described how Spartina, this horribly fast spreading weed that takes over my lawn can be likened to not being attentive to the changing technologies and finding your "lawn" chocked off by foreign knowledge you don't know how to work with. I thought it was a fluff piece, but I liked it anyway. Today it consistently bumps in and out of the top ten posts on TESTHEAD, which I think is pretty cool. Fieldstones come from many diverse places. Be prepared to look where you might least expect them :). Sometimes we gather stones that don't fit. That's fine, don't use them, or at least not at that moment for that particular project. Jerry uses the following phrase to illustrate the point: "Chop 1 1/2 cups of raw onions. Brown the onions in 1/4 pound of unsalted butter. Throw away the onions. Keep the butter." Many times we will have ideas that help season something we write, but we won't use but a handful of what we've gathered. That's OK, too. The simple fact is, there's lots of things we gather that seem useful, and may be at some point, but we won't know until we stop gathering and start organizing. The organization phase can oftentimes be as challenging as the initial gathering. Jerry recommends a number of tools to help this process, including creating an abstract statement, then building an outline, or rearranging ideas until something jumps out at you. Environment plays a hand in this, Jerry likes to use music to help him write, as do I. There's a fine line, though. I need something that's moving enough to carry me, but not so moving that I get lost in the music and forget what I'm doing. Not sure why, but country music actually seems to be the best for me to write to, though I'll certainly also do well with classical, jazz or rock, too. In addition to organization and placing stones, we often need to shape them as well. This where creative license comes into play. Sometimes florid speech is desired, sometimes spare speech is better. It's often contextual, and only you will know what's required at a given spot. Sometimes it requires us to speak in a dispassionate and detached way, other times we need to inject ourselves directly into the story or item we are writing. Sometimes dropping in a good quote works beautifully. It's all in what you intend to build and how you want to have it appear. The final piece is putting it all together,and sometimes to do that we need to use mortar, both in walls and in speech or writing. Not enough mortar and the wall can lack cohesiveness. To much mortar and the structure can crack and break up under its own weight. Pacing, rhythm, some slang here and there, all come into play to ties our stones together. Don't be afraid of them, but know when they are being used and what their purpose is. A little goes a long way :). Jerry closes the book by describing what we can do after we get our fieldstone walls, houses, or castles put together. A discussion of the methods of publishing, finding agents, and "the Matthew effect", which is take from the Bible: For unto every one that hath shall be given, and he shall have abundance: but from him that hath not shall be taken away even that which he hath. Huh? What Jerry is saying is that, as you start creating, writing and "shipping" your ideas, often people will come out of the woodwork to give you more fieldstones to use. Maybe itss reputation, maybe its experience, maybe it's a sort of camaraderie, but if you do something cool, people will be drawn to your efforts and may well help you. This is a very intuitive approach to writing, a process of gathering, organizing, and shaping to piece together what we do ultimately write. It's really the process we all use when you get right down to it. I just never realized that what Jerry was describing was gathering Fieldstones. It's a great metaphor, and one that really helps put your writing practice into perspective, and helps explain why some things stick and some others don't and why that's OK, really. If books about the craft of writing interest you, then there's much to find of interest in here. I'm just sad it took me this long to get to it! Thank you for this generous review. You should know that I grabbed a few fieldstones from it. You're that good! Thanks for the comment, Jerry, I really appreciate it :), and thanks for writing the book in the first place. It's nice to have a vocabulary for something I was doing but didn't quite know how to explain it!